Looking for Package Deals to Oahu? We have those too! 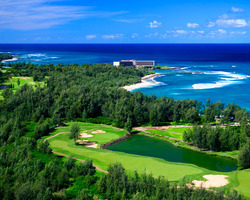 Oahu has a truly diverse collection of golf courses. As you might expect, there are balmy layouts with coconut palms. But there are also courses carved from tropical rain forests, and courses cut from mountainous, desert-like terrain. There are courses built of former ranch lands and fields of sugar cane, and seaside layouts that resemble British links. Constant sunshine makes for long hours of dependable golfing weather, and the spectacular surrounding scenery quiets the mind and stirs the heart.